Premium polyester fabric wallet for a classy and neat touch when carrying your pills anywhere you go. Convenient travel size with 21 individual plastic pill compartments saves space in your luggage by leaving all your pill bottles behind. Five compartment wallet allows for easy carrying of passport, medical prescriptions, travel documents and pen. Waterproof premium plastic zipper bag included which can be used to pack liquids and travel accesories. SAVE PACKING SPACE BY LEAVING BEHIND ALL YOUR PILL BOTTLES - Holds up to 21 days of vitamins (5 big pills per day) or 7 days of vitamins (15 big pills per day). Each individual compartment holds up to 5 fish oil capsules. 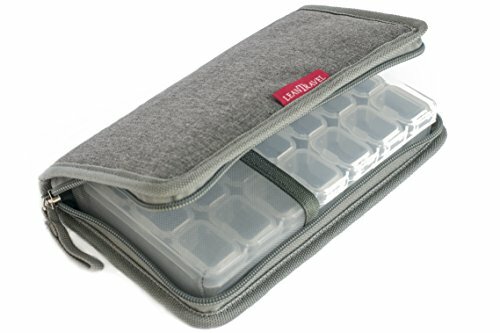 THE MOST CONVENIENT TRAVEL SIZE - Fits perfectly in any travel bag or carry on (Dimensions pill case: 7.25 in x 4 in x 1 in). Take your pills 1, 2 or 3 times a day for a 1, 2 or 3 week trip. If you have any questions about this product by LeanTravel, contact us by completing and submitting the form below. If you are looking for a specif part number, please include it with your message.